Attending a conference is a good way for a new pet blogger to learn how to take their blog to the next level. 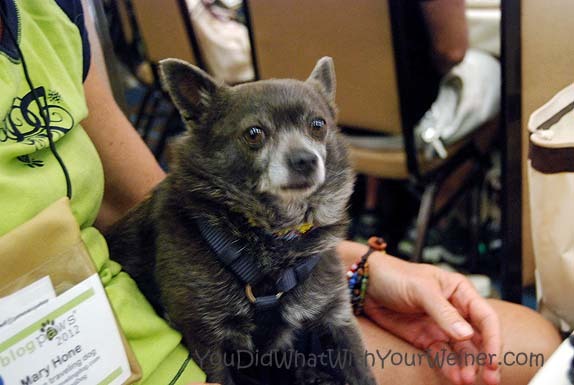 The first conference I attended was one specifically for the pet blogging niche – BlogPaws. 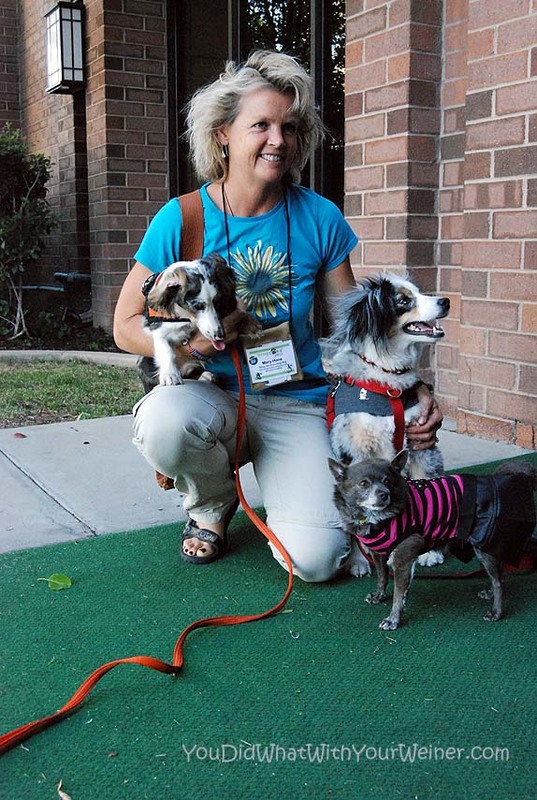 BlogPaws is a conference for pet bloggers that brings you workshops and lectures on subjects that help you be a better, more successful pet blogger. Besides being specifically for bloggers in the pet niche, it’s also very unique because it’s the only pet friendly conference. That’s right. I could bring my dogs! 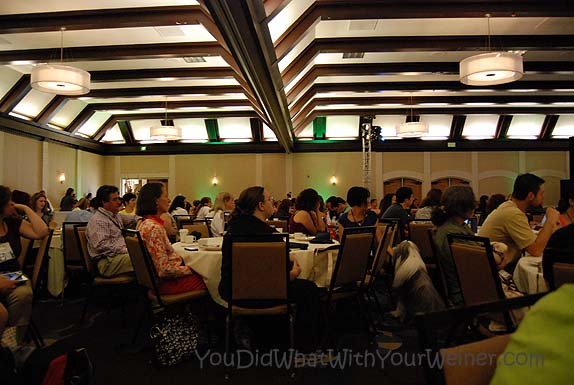 Conferences are a big investment for a new blogger, especially one who isn’t making any money from their blog yet. The first year I knew about BlogPaws, it was held on the east coast. I wanted to go so bad but there was no way I could spend thousands of dollars to fly there from Seattle and put myself up in a hotel. I watched from afar instead and learned about the details of the conference from my fellow pet bloggers that posted about it afterwards. In 2012, the BlogPaws conference was held in Salt Lake City, UT… which is way closer to Seattle! I was still on a budget but I decided I was going no matter what this time! I had to cut a lot of corners to do so though. I decided to drive instead of fly. The main reason was that I wanted to bring both Chester and Gretel but I couldn’t fly with two dogs in the cabin. My car was a gas guzzling SUV so I carpooled (road tripped) with some local pet blogging friends who were also going. The conference was held at the Sheraton Hotel but we camped at the Salt Lake City KOA campground instead of paying over $100 a night for a hotel room. The only piece of the equation I didn’t have yet was an actual ticket. 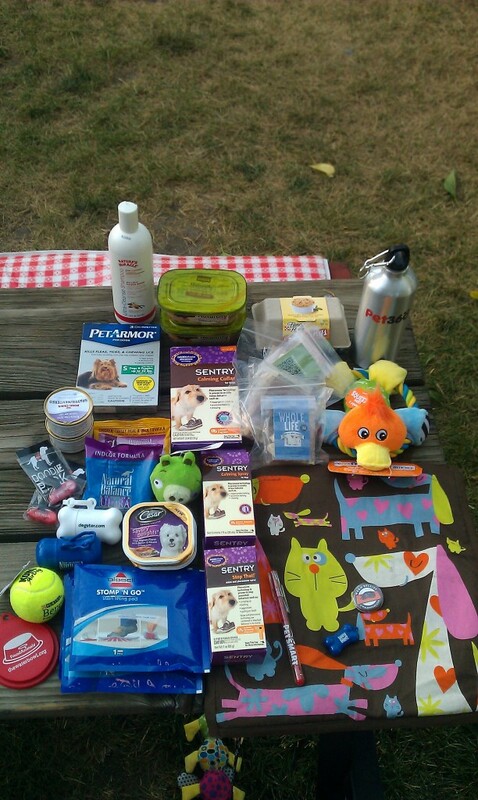 Lucky for us, our bloggy friend Sugar the Golden Retriever was giving one and we won! Traveling on a budget is usually an adventure and this was no exception. Let me tell you a little more about how our trip went down. 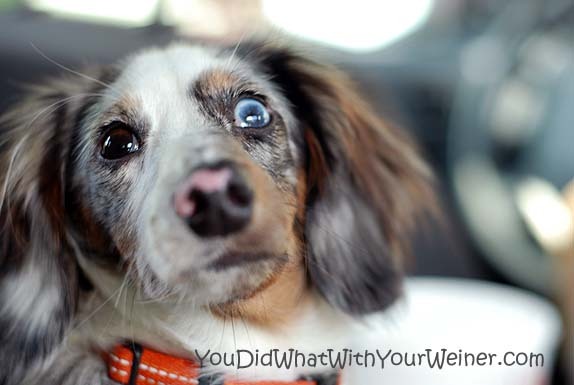 I drove to our friend’s house, It’s a Weinerful Life, on Wednesday night. 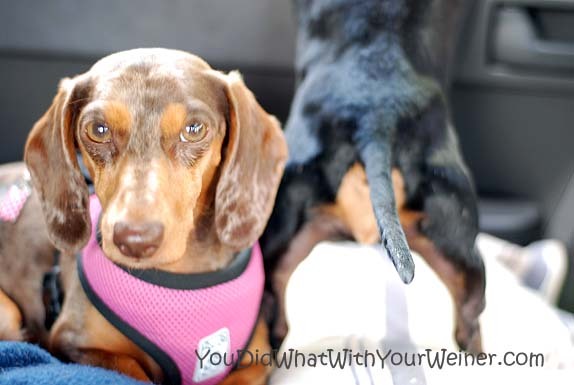 Thursday morning we got up at 3 am, loaded the wieners into the already packed car and hit the road before daylight. We drove south from Seattle and then east through Yakima, Eastern Oregon, and Idaho into Salt Lake City. We drove the whole way non-stop and it took us 15 hours. Before we left, I had emailed Mary of Tales from the Back Road so I knew they were staying at the same campground in their RV. While we were setting up our tents, Mary’s husband just happened to walk by with one of their dogs Torrey. Of course I recognized Torrey first. We were exhausted from our drive but we just had no go over and chat before we passed out in our tents. It was HOT so it was a little hard to go to sleep. It was also kind of early so there was a lot of commotion around the campground that kept Chester alert and taring into the dark for a while. The next morning we arrived to the conference and ate breakfast. The first person I recognized was one of our ex-Adventureweiner Club members that moved to California, Elizabeth from Dog Blogging With Luna. Literally a split second later we spotted Mary and Roxy. We went to the side of the room that had empty chairs to eat our breakfast and listened to the Keynote by Betsy Saul, the co-founder of Petfinder. Since Petfinder is how I found Gretel I was particularly interested in hearing her talk. She talked about upcoming concerns the pet industry will face, including the controversy between getting your animal spayed/neutered and non-surgical sterilization. It happened that we sat next to the ferret blogger table. Chester has a high prey drive so he was going nuts. Conference attendees don’t mind the occasional bark at the conference but it was distracting me and driving me nuts trying to keep him under control. Then I discovered that they had a free doggie daycare there! I felt bad ditching Chester for the rest of the day but I am sure both of us has a better time that way. I took Chester to daycare right after breakfast and left him the whole day. I packed lighter the second day. Little did I know that there would be a heck of a lot more swag to pick up from vendors. I ended up carrying my regular bag (which suddenly didn’t feel as light as I thought it was) and two shopping bags full of stuff around for 8 hours. Oof! The highlight of the day was hearing Lena West, the founder of Influence and Expansion, speak. I heard a couple of people didn’t like her radical honesty and how up-front she was about what was stopping each and every one of us from earning money on our blog. She was just my style though. I love honest people who tell it like it is and the things she said inspired me and really made me think. I was so inspired that skipped out on the SEO 201 session to see Lena give one lucky blogger’s site a critique and makeover. The blogger being critiqued wasn’t looking to monetize her blog but some of the tips Lena gave her were applicable to everybody. I said I skipped out on the SEO 201 workshop right? Well, I kind of feel like I got part of it. The presentation was in the room next to us and the presenter was yelling so loud that I could hear him clearly when Lena took a breath. Sometimes it was even hard to hear her over him. I managed to catch a couple of things he was saying so I guess you could say I got a 2 for 1. ha! Between the 15-hour drive down, all the socializing and learning and the heat, we were exhausted and ready to hit the road Saturday after the main sessions were done. We didn’t stick around for the evening reception and the Wet Noses awards but we did manage to meet up with our pals from Tales from the Back Road and Snoopy’s Dog Blog again for some photos. We headed to Twin Falls, Idaho for the night. We stayed in the Motel 6, which is pet friendly and doesn’t require a pet deposit. Getting a head start on the drive made the trip back less grueling. That last, final push took a little over 12 hours and we got back when it was still light. I was tired and grumbling that I was too old to drive 30 hours in two days (and sit 2 days in between at a conference). Not two days later I was already dreaming of a road trip to dog-friendly Carmel, CA and Jackson Hole, WY to visit some of my bloggy friends. Ha, ha. I also caught the conference bug over the weekend. 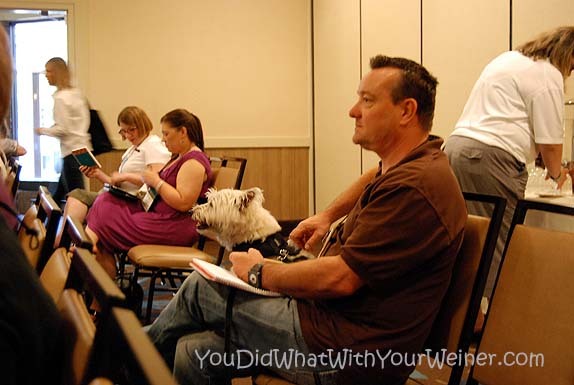 By the end of the week I had figured out a way to attend the Barkworld, another social media conference for pet bloggers, and already booked a flight and hotel. The day after I got back I started sorting through the stuff we got from the vendors at the conference. We came back with a lot! 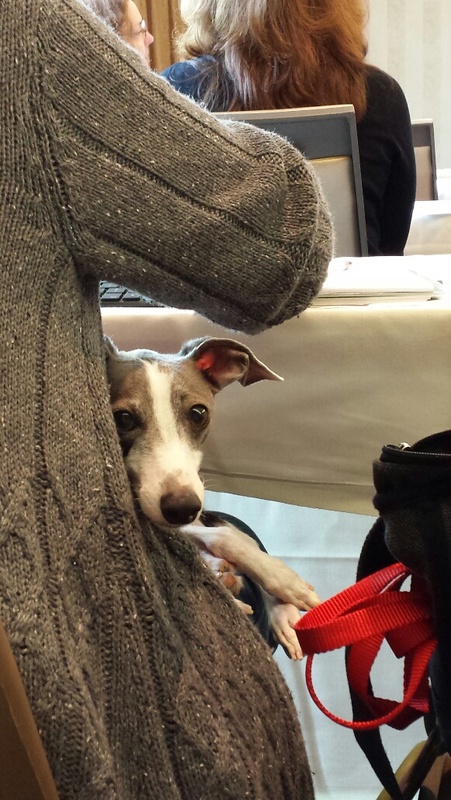 What Did I Think of My First Pet Blogging Conference? 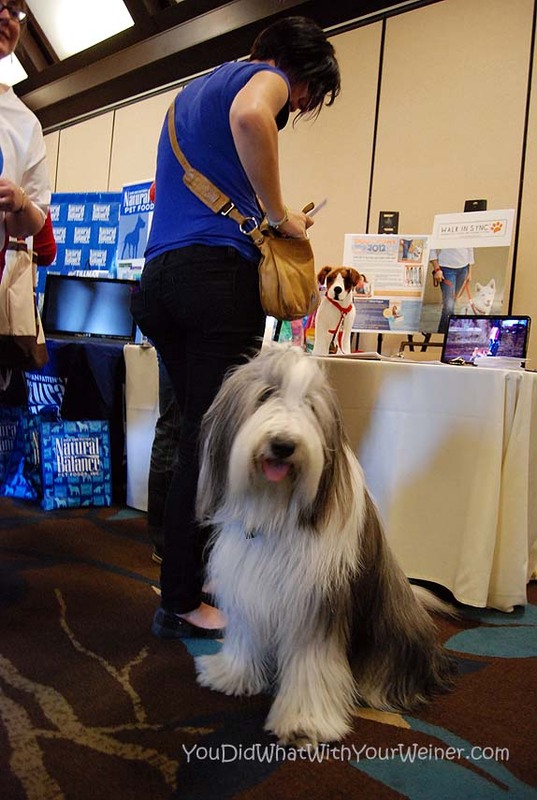 Overall, the BlogPaws conference was great! I learned a lot of things that would help me improve my dog blog and connect with our fans better. The food was amazing. Especially the infamous cheesecake! We met some of our bestest blogger friends, met a lot of vendors, and picked up a lot of free, new products to try. I left with a sense of empowerment and with the knowledge that I could make a living from pet blogging. 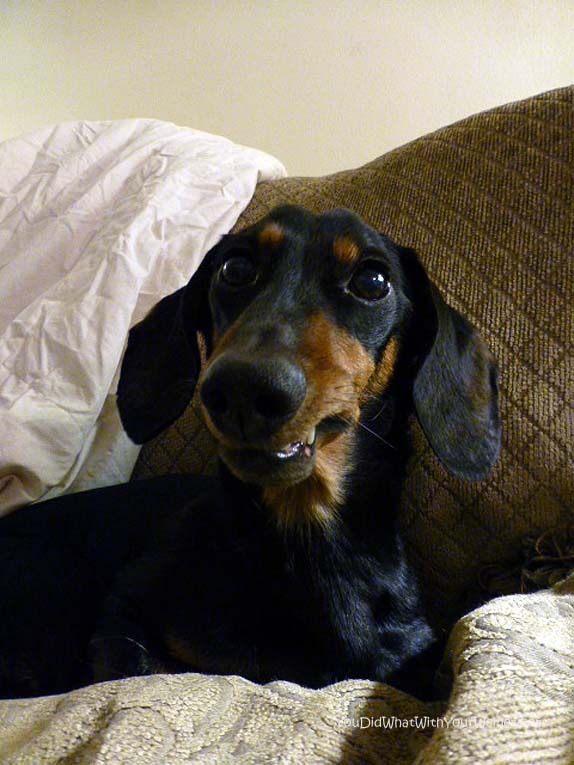 A couple of days after I got back from BlogPaws conference, I felt a little let down. Sure, BlogPaws was great. It was the best thing that happened to me so far this year in the world of blogging. I made a lot of connections at the conference. I managed to connect with the 50+ bloggers on my list that I had been making virtual friends with all year plus many other new “bonus” friends. I got a lot out of the presentations but it was the connections that I made that were priceless. Among those connections were enthusiastic discussions of future partnerships, promises of help and support and kudos for all of the hard work I’ve been doing. At the conference, I was genius, unstoppable, on fire! My dreams were big and I was certain I got the tools, and made the connections I needed, to make them happen. Then, once I was back home, and saw things through the lens of reality, a lot of my ideas looked silly, daunting, or just plain impossible. I was left wondering if the people who offered support were just heady from the conference buzz too…or maybe used one too many free drink coupons. I worried that now my face wasn’t in front of them, people wouldn’t remember me or our conversation. I was no longer a celebrity but just a crazy dog lady. I was back among a crowd whose eyes started to glaze over when I mentioned things like blog hops, analytics, or showed them the hundredth picture of a dog and squealed “how cute is that?”. I suddenly felt disconnected, let down, and a little isolated. I learned later that this feeling is common after a post-conference high. I was hoping that, by the following week, I would have a game plan and would be moving ahead full-steam. Oh that sounds like a great adventure! We hope you win that ticket from Sugar as well! We bet Chester and Gretel will love the trip. We can only imagine what sort of things you’ll learn from this conference. Jess, I so admire how you are living your life, and really appreciate your sharing it with us. I’ll see what I can do to get your ticket for you. I’d be happy to chip in along with others who follow you. A little bit from each of us would go a long way to that ticket! OMG Bruce. You are too kind. The face that you actually read what I write and take the time to comment is all the thanks that I need! It’s people like you that make all of the work I do worth it. I hope you are coming Saturday because I was going to give you a couple of Adventureweiner stickers. I planned to climb Mt Adams with Chester and Gretel for charity (canine cancer) but will all that is going on I am not officially announcing it until I can make sure I can still fit in all of that training with my family responsibilities. If I can make it work, I will be looking for donations to that. Wow! That sounds like it will be a great adventure. I’m hoping to go to BlogPaws this year too. I was thinking about driving out. My drive from Southern California would only be about 8-9 hours. Good luck winning the ticket! Hopefully we see you at the conference. I hope you get to come! I can’t wait to meet you! I would love to meet you and Toby too. If we happen to be in Utah in August, we should meet up. That would be fun! I hope you win the ticket. That would be so great! I would love, love, love to meet you guys. You are not going to BlgoPaws? 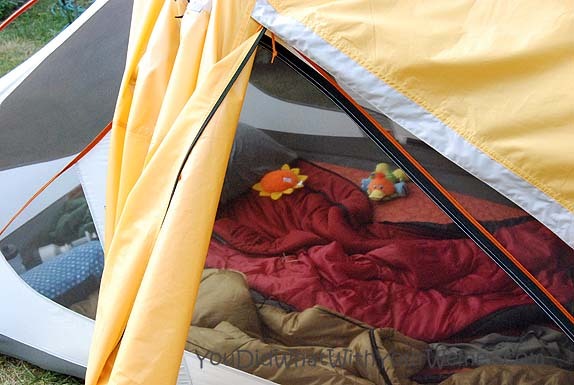 What a great idea to camp out! I wanted to come up to the conference from CA but between the plane ticket, the room, and the price of the conference it was way out of reach for me too. 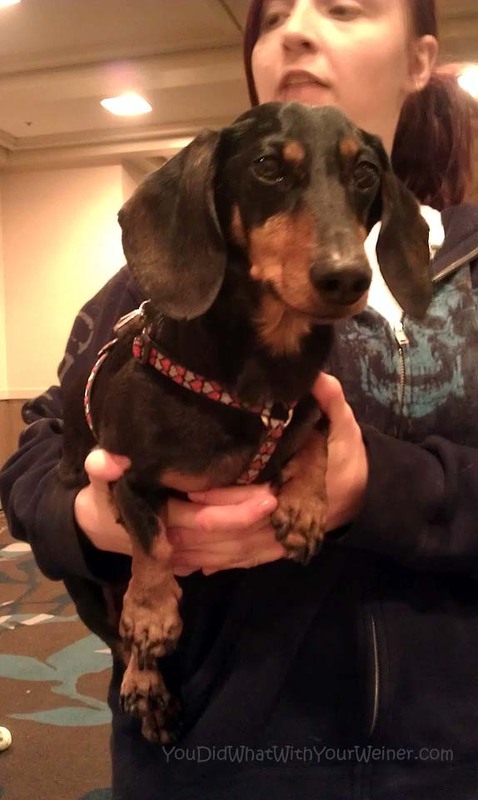 Maybe you’ll have a camp buddy and another dachshund to hang out with! Nice! I’m saving my pennies now! Good luck with the contest! You sure deserve to win. Sounds like a great adventure you have planned! Thanks. I hope I win too but I will find a way to make work anyway. Good luck on winning! I’d love to go, too, but SLC is a little farther away from me. If I can win the lottery between now and then, it’s a done deal! If I win the lottery between now and then I will pay for you to go 🙂 I would sure like to meet you. I guess I need to start playing to win huh? Ha, ha. I was too new to go last year and I REALLY want to go this year . .I hadn’t even considered driving – I need to look and see how long it would take from Portland! I LOVE that you are planning already – I hope I get to meet you there!! Less than from Seattle 🙂 Probably still at least 10 hours though. I hope you can make it so I we can meet too. I think that BlogPaws sounds like a lot of fun, but I was a new blog as well last year, and this year, Salt Lake City is far too far away (I’m in New York)! Your road trip sounds like a blast! Don’t forget, you can use the GoPetFriendly.com road trip planner to find campgrounds, restaurants, and fun stuff to do along the way! I want you to win the ticket!! (Hear that, Sugar?! lol) I can’t wait to read about all of your adventures. So much fun! good luck 🙂 from a contest junkie!! Oh, my fingers will be crossed for you. I went last year, but had to leave early due to hurricane Irene. I will be attending this year so I’d love to meet up with you! I’ll put you on my list of people to get in touch with before the show to exchange numbers if you want. Oh that sounds like fun! We’re hoping to go, but the flight from Vancouver to SLC is like $600! I guess I could fly out of Bellingham and save myself a couple bucks… may find a way yet! I would really love to be there! I’m sure you will have so much fun! (And I hope you win the ticket!) I went last year and it was so great to meet some of my favorite blogging friends in person. I wish I could go this year and meet you, but I have the opposite problem, since I’m on the East Coast. Can’t wait to meet you at BlogPaws. Since I’m flying from the East Coast, Honey won’t be able to join me this year. But I’m hoping I can get some puppy lovin’ when I meet Chester and Gretel. I’m sure they’ll love it too. Yes! We’re so glad you won! You’ll have so much fun!!! I had so much fun reading your post..Thanks for sharing with us..
Nice post. I wish I could go this year and meet you, but I have the opposite problem, since I’m on the East Coast. Thanks that you’ve shared this with us. The conference itself is pretty affordable…..it’s the travel and hotel that crush your plans.